Commercial trailers are used to carry everything from cars to livestock to various types of heavy equipment. Also known as flatbeds and loaders, they are a key component of any distributor. Many retailers and construction companies, with wide varieties of equipment, utilize them too. 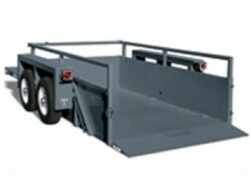 Industrial trailers come in many sizes and with special features, but they tend to vary in length from 45 to 75 feet. Some trailers also come equipped with heat (for frigid weather conditions) or refrigeration (to protect perishable products). Pressurized and ventilated trailers are also commonly found on the roads. Another version of the commercial trailer is the auto carrier, used for the bulk transportation of vehicles. Some trailers come designed with a loading ramp, making it easy load and unload heavy construction equipment, including low clearance machines. Some loading ramps have the capacity to sustain extremely heavy equipment, so construction machinery can be driven directly on the ramp. Loading ramps that support 30,0000 lbs are not uncommon. Trailer platforms vary too. Some come with a rugged surface and tracks that help grip tires. Additionally, most models come slots and pockets for easily securing heavy cargo. 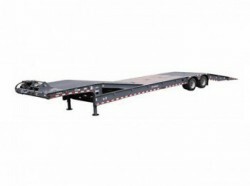 Some trailers come with vertically adjustable platforms, which allow users to raise or lower the platform several feet.